It began the way the best stories always do, with a boy and a girl who fell in love. In the 1950’s, Jay and Sandy Niederhauser met on a street corner in Salt Lake City, Utah. More in love now than they were in 1959, the couple has now spent over 50 years together. Today the couple spend their days and nights together, as the nation’s longest married innkeepers, Utah’s own, Innkeepers of the Blue Boar Inn in Midway, Utah. The Blue Boar Inn is the consummate in romantic getaways; beginning with a majestic mountain canyon drive, to resting perched atop the valley, one can do nothing but find love and peace while enveloped within the grand home that is the Blue Boar Inn, escaping the trivialities of worldly concerns. Jay Niederhauser is a humble and terrific Swiss host, an amenity and extravagance of the Inn; as a guest, you could not find yourself in better company. 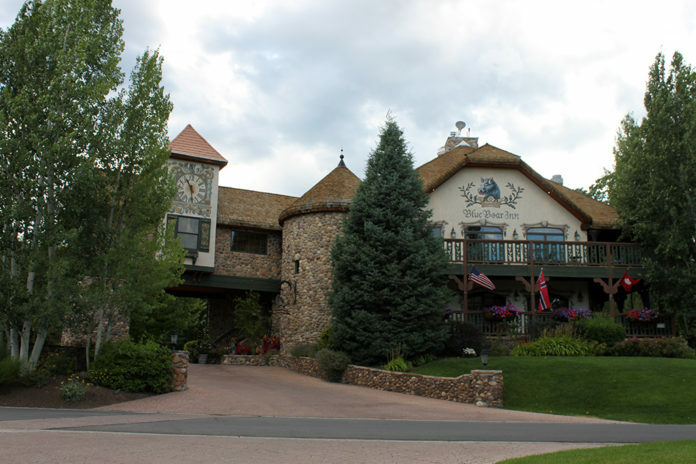 An European Inn with Alpine decor, no expense is spared in the operation of this grand Inn. From the Hinterhoff (the patio behind the inn) to the Truffle Hollow (the bar/pub), ornate decorations adorn the walls and line the hallways – laminated bone stock crossbows from the 13th century, still life paintings from France commissioned in 1850 by Jean Maxime Claude, Kochelofen wood stoves,… the Inn stays true to it’s European Swiss roots. The Inn has been awarded Best of State in both categories of Best European Fine Dining and Best Brunch year after year. 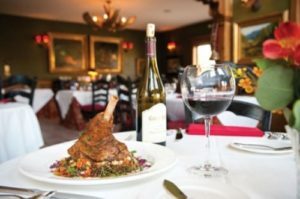 The Blue Boar Inn has donned 31 Best of State Awards including Best Sunday Brunch, Best European Dining, and Best Wedding Anniversary Package, lest we forget to mention the Boss Award in Dining and Best Inn: a 25 lb. Gold Statue, demonstrative evidence depicting the best of the best. 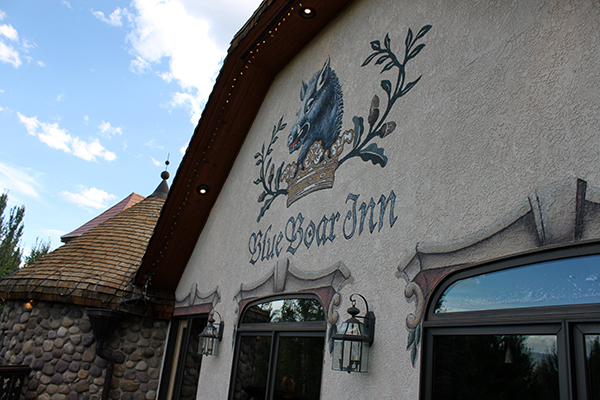 Gabriel and I visited the Blue Boar Inn for our 11th Anniversary, after visiting the previous year as a dinner guest. 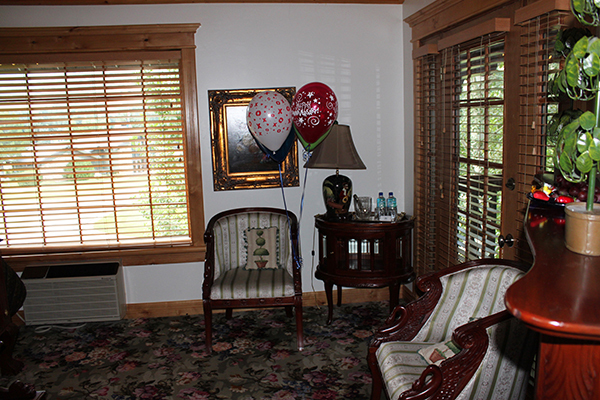 While there, we had the pleasure of receiving a grand tour of the Inn, including several of its exquisite rooms. Each one of the 12 rooms of the Inn is named after a famous author, from Austen to Shakespeare and is furnished and decorated with beautifully inspired creations fashioned after their namesake. Entrance to each room, including non guest rooms-23 doors in total, begins with a stunning, elaborate carved woodcut on a 200 year old door. The Jane Austen Room, one of the Deluxe Rooms, is composed of elegant Nordic ambrosial bedding, a library of Austen’s works, and a turret window seat one could imagine Austen herself sitting at, as she once did in Hampshire conceiving a literary romance. The William Shakespeare Room, one of the Grand Suites, houses an Italian carved Rococo King Bed with triple layered bed skirts, extravagant gold linens and double sided bedding, a Romeo balcony, Roman Columned Spa Bath, a fireplace jutting into the middle of the room and lavish seating becoming of a scholarly gentleman. 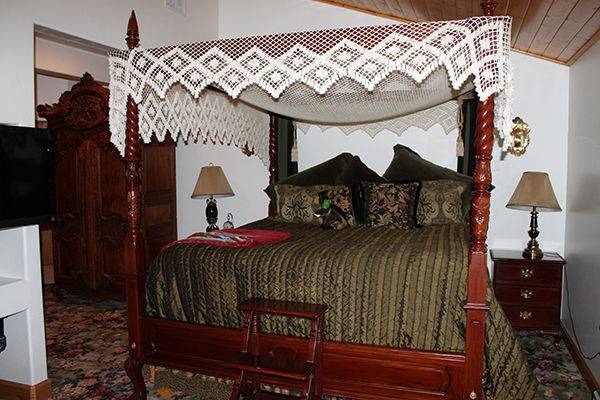 The Geoffrey Chaucer Room, a Traditional Room, is enhanced with an Austrian Folk Art Canopy Bed, river rock gas fireplace, and a view of the blooming European cottage garden. Not to be outdone by the lavish guest rooms, the restaurant offers a menu fit for a King. I ordered the Grilled Filet Mignon-charred onions, roasted potatoes, grilled mushrooms with a pinot noir reduction sauce and the House Blue Boar Salad-mixed baby greens, with dried cranberries, candied walnuts with a maple vinaigrette; Gabriel the Jagerschnitzel-breaded veal cutlet, sauteed spatzel with a forest mushroom gravy and the Soup du Jour-clam chowder. Each of our meals were outstanding, though I must confess… our host Jay ordered the Wild Boar Spare Ribs-chef seasoned, yam puree, sauteed greens, and I found myself envying his choice all evening, especially once he allowed me to wet my palate with a small taste. 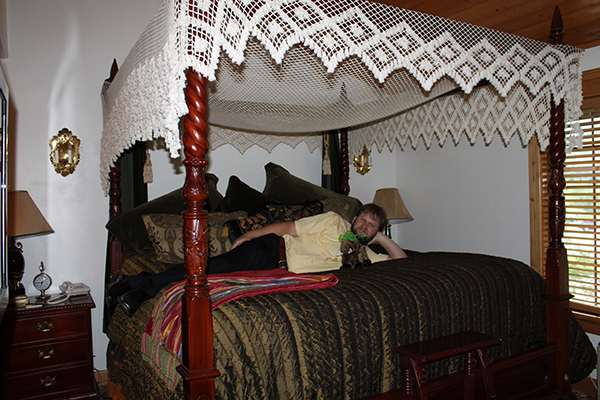 Gabriel and I lost ourselves in the ambiance of the Blue Boar Inn, and in the company of Sandy and Jay. Our visit and dinner excursion lasted over 4 hours, excluding travel time. After each visit to one of the exquisite themed rooms, I found myself begging to see what the next room would unveil, imagining a romantic weekend spent in each castle chamber. Every last detail of the Inn is impeccable. 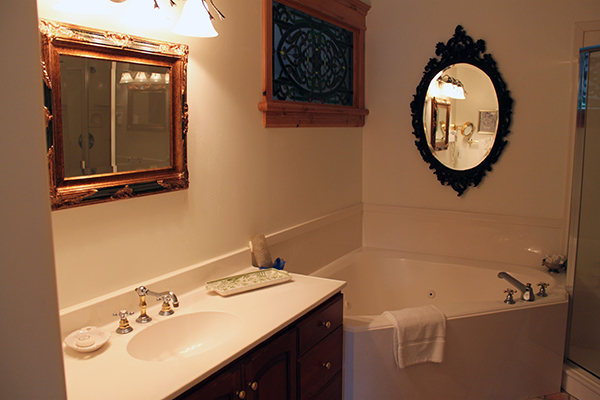 The Blue Boar Inn is absolutely harmonious and accommodating. Our meal was comped as guests, however, we paid to stay the evening in the Elizabeth Barrett Browning room for our Anniversary. It was every bit as wonderful as we expected. ► For Kids: This is a romantic adult getaway. We spent the night in the Jane Austen room for the first time alone since having kids, and it was our first time leaving the babies overnight. I worried and fussed about how they were the entire time, and we didn’t even enjoy sleeping in because we missed them so much. 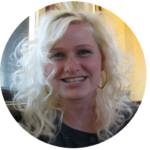 If you are a more seasoned parent, you’d probably have a much different experience. We absolutely loved the experience, regardless. Become a fan of the Blue Boar Inn on Facebook to receive periodic updates and special offers, like 50% off last minute bookings! Plus, recipes and cooking tips from the restaurant chef! ► Nap-Time Version: Our romantic stay at the Blue Boar Inn in Midway, Utah and our exquisite and savory dinner at the Inn’s restaurant. This place makes the Anniversary Inn in Salt Lake City look like a prison cell. Check out the other fun activities we’ve had in Utah! This blog is so much better than my cousin Steve’s blog. He really doesn’t know what he’s writing about.